Champion Realty is proud to announce that Matt Wyble, a sales associate in the Severna Park office, was chosen for The Daily Record’s 2012 “20 in Their Twenties” list of Maryland up-and-comers under age 30. Honorees are selected by The Daily Record staff for their professional accomplishments, civic involvement and impact of achievement. “I’m excited to be the only real estate professional chosen this year, and I look forward to meeting the other honorees and learning how they got where they are in their fields,” said Wyble, age 27. He joined Champion Realty in 2010 and in the first two years sold more than $14 million in real estate, qualifying him for the Anne Arundel County Association of Realtors Distinguished Sales Achievement Club. He considers his grandfather, Ray Grant, former owner of a local real estate brokerage, a force behind his success by teaching him such lessons as, “Treat every customer with the same high level of service” and “Always go above and beyond.” Previously, Wyble was marketing coordinator for the Greene Turtle Franchising Corporation, where he honed his ability to connect with customers and present businesses to their best advantage. 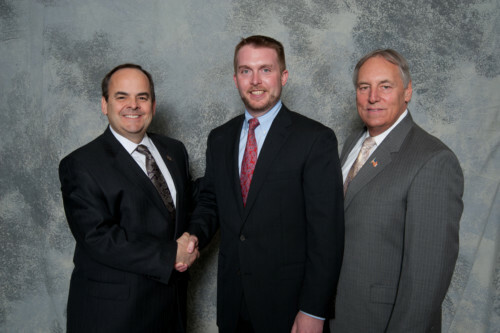 Wyble is the youngest director on the board of the Greater Severna Park Chamber of Commerce. In 2010 he helped launch the Taste and Sip of Severna Park fundraiser, with proceeds donated to beautify the town. He has also served on the board of directors for the Brick Companies Foundation, which focuses on social and environmental responsibility. Born and raised in Severna Park, where his great grandfather also was a real estate broker, Wyble graduated from Severna Park High School and attended Virginia Tech, receiving a BA in public relations and marketing in 2007. “My family has been active in Severna Park since the 1950s,” Wyble said,“and my overall goal is to carry on my family history both in real estate and in positive contributions to the community.” He lives in Severna Park with his wife, Ashleigh.